I recently purchased new ear buds for my commute; my old pair had seen better days. The brand I purchased is notorious for good sound quality but fragile wire. I’ve owned ear buds from this company and the wires eventually lost continuity at the connection near the plug and buds. 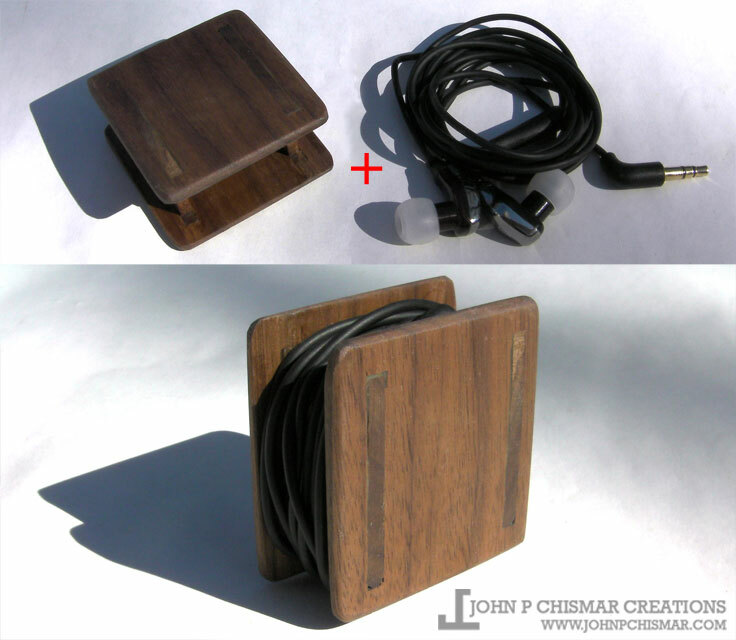 To help reduce the abuse of the vulnerable wires I made this spool from walnut wood to protect the ear buds. The ear buds are placed in the center of the spool, the wire is gently wound around the spool and the plug is tucked between the wall of the spool and the wire. I may improve the design at some point, but for now I’m pleased. The E-Z Up Embassy my wife and I enjoyed for ten years was lent to unfamiliar hands and returned with bent and broken truss parts. I know how easy it is to bend the truss parts on the Embassy because I’ve done it myself. In the past I’ve ordered replacement parts from E-Z Up, however when I reached out to E-Z Up they notified me replacement parts for the Embassy are no longer available. I live in the suburbs near several large parks. These parks become graveyards for broken and twisted canopies after sports games on busy summer weekends. Instead of throwing fifty pounds metal and tarp into the dump I was determined to return our ten year old canopy to its original glory. I decided to replace the compromised metal truss parts with identical parts made from straight grained maple wood. After the maple wood truss parts were sanded and sealed they were installed in place of the broken parts. The repair works like a charm. And our canopy will live to see many more warm days in the open air, not in a landfill. A friend asked me to build a small wooden box. I curiously asked, “What for?” and learned he needed something to prop under his central box-spring support. The central support on his frame runs from head to toe with a single foot that drops down in the center. Over time the support and the foot became bent and twisted; the foot actually broke off completely. I felt a box wasn’t exactly what was needed and I drew a few sketches of alternate designs. We decided on a pyramid and I got busy in the workshop. The final piece turned out perfectly. The construction is entirely mortise and tenon which makes it easily assembled and disassembled. The Krugtch (adding a twist to my friend’s name) serves dutifully as a crutch keeping his bed and box-spring solid and in place. Patience, time and inspiration are necessary when encouraging creativity to blossom. 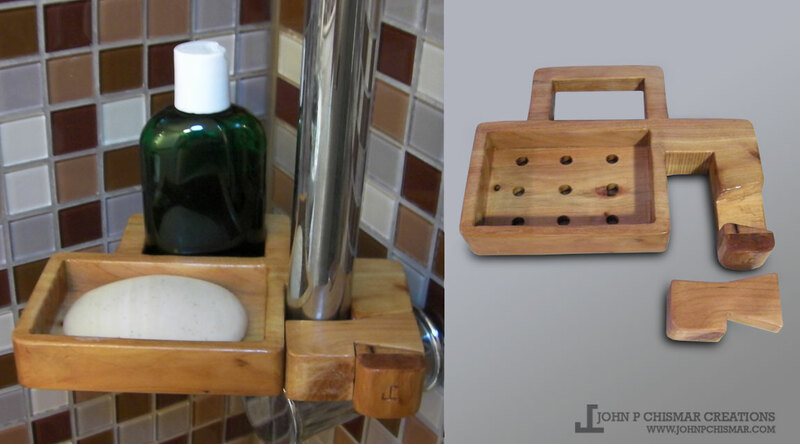 My dovetail key shower soap dish is not an exception to this rule. Two years of brainstorming ideas and designs in my head culminated with an afternoon in the workshop. I found inspiration in a beautiful wedge shaped shampoo bottle provided by my wife. As soon as I held the bottle all the pieces fell into place and I merrily went to work. I am pleased with the result and I’ve put it immediately to use. It’s doing its job well.